Home > Vitamin Basics > How Were Vitamins Discovered? 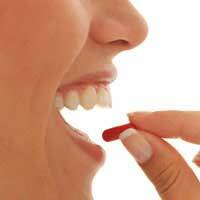 Vitamins are compounds that are essential to life and health in small amounts. Some vitamins are synthesised by humans and animals, but the key source is from the diet. A varied and balanced diet should supply all the vitamins required for good health. Vitamins were discovered through research over many years. Even before people were aware of the role of vitamins, they used foods rich in vitamins to cure disease. The Ancient Egyptians gave people liver to cure night blindness, which can be caused by a lack of vitamin A. Sailors on long sea voyages developed a deficiency disease called scurvy. This causes spots on the skin, and bleeding in the mouth and gums, and can lead to loss of teeth. Scurvy results from a lack of vitamin C, and in 1749, a Scottish doctor, James Lind, found that citrus fruits, including lemons and limes could prevent and cure the disease. Polished or white rice is made by removing the hulls, but this also removes many of the nutrients. People eating only white rice can develop beriberi because they have a lack of vitamin B1 (thiamine). People with beriberi are tired and weak, and develop pain and swelling (oedema) in their arms and legs. They can also have irregular heartbeats and may develop heart failure. In the 19th century, researchers found that feeding chickens with brown rather than white rice prevented beriberi. Also in the 19th century, a Japanese doctor, Takaki Kanehiro found that giving meat, fish, barley and beans to people who only ate a diet of white rice prevented beriberi. Scientists worked out that there must be agents in foods that were vital to health. These became known as vitamins, from ‘vital amine’. This was because scientists originally thought that all vitamins were from the family of nitrogen-containing compounds known as amines. During the 18th and 19th century, scientists carried out studies on animals, and identified the activity of the first vitamin, antirachitic A (now called vitamin D), which cured rickets in rats. The vitamin itself was identified in 1922 as part of research into rickets. Vitamin B9 (folic acid) in 1933. Vitamin A was next – it was discovered in 1917 by two groups of researchers in the USA and first synthesised in 1947 by Dutch chemists. Vitamin C was discovered in 1912, isolated in 1932 and synthesised in 1934, making this the first synthetic vitamin to be available to people to take as a supplement. Vitamin E was discovered in 1922. Vitamin K was discovered by German scientists in 1929, and was named the ‘Koagulationsvitamin’ (so vitamin ‘K’) because it affected the clotting of blood. It was synthesised in 1939.